One of the things we bought from the asian supermarket yesterday, was sugar cane. So today I educated Tim on how to eat it: peel it (the skin is very tough), cut off a chunk, rip pieces off with your teeth, chew to get all the sugar water out of it, and spit out the balance. Remember to avoid the reddish looking bits, they taste funny. It completely transported me to the days when my dad co-owned a sugar farm. Sometimes we would go to the farm with him and help ourselves, other times he would just bring a few sticks back for us. I don’t think I have eaten sugar cane for about 20 years!!! While sitting in the sun (it did shine for about an hour or two today! ), I continued to read the book I bought earlier today. Tim decided that he wanted to go to Waterstones to go and buy a book or two. We ended up buying 5 altogether! I don’t know whether anyone has made it through life without reading a Mike Gayle book – and if you have, you’ve missed out. The first book of his I read, was Mr Commitment. We had gone away to Geneva, Switzerland for the weekend: Lisa, Arna, Damien and I. Rebecca was supposed to go (Damien’s wife), but she had a passport problem last minute so Arna, her sister, ended up going in her place. I seemed to be the only one to had taken a book with me to read, and because it was so funny, I was constantly reading snippets from the book to everyone. Every now and then, Damien would say: “read a bit more” and then “read a bit more”. Eventually I ended up reading the ENTIRE book out loud. It was so weird. It reminded me of primary school where the teacher would read to the class. But the long and short of it was, everyone loved it. In fact, Damien, who was not much of a reader himself, went out and bought (or was that borrowed?) 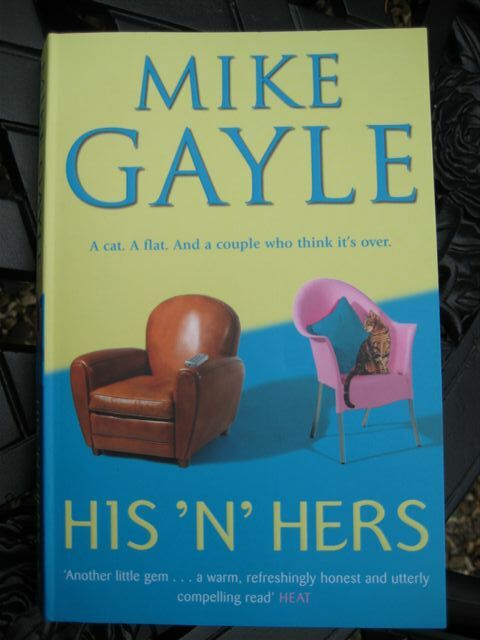 another Mike Gayle book which he read himself …. Since then, I have read every Mike Gayle book that comes on the market. Somehow I missed this one. It had in fact been released a few years ago. But this is the thing with his books: I just can’t put them down. And here is the proof: I started reading it at about lunch time, and I have just finished it!!!!! To put that into perspective, I am still busy reading “The last debutantes” by Fiona McCarthy, and have been reading it for about a month. It is really interesting, but very factual so it is rather slow going. But this “His ‘n Hers” book is the type of book you can just fly through.